After struggling to meet its enrollment goal, Foundation Preparatory Academy must rewrite its budget for a student body less than half the size leaders envisioned for its inaugural year. The charter school’s board members discussed enrollment and minor problems with the classrooms during a regularly scheduled board meeting Wednesday night that lasted just eight minutes. Six board members sat around two kid-sized lunch tables, alongside founding Head of School Myrialis King, in an echoey community center next to the school’s not-yet complete modulars in the Michoud neighborhood. The literacy-focused school opened to kindergarten students on Tuesday. That same day, it unexpectedly opened enrollment for first-grade students, who will begin Aug. 17. The school’s charter documents said it planned to enroll 108 kindergarteners this year, and add a new grade level each year as it built a full elementary school. Board members learned Wednesday that the Orleans Parish School Board, Foundation Prep’s authorizer, wants the school to submit a revised budget in two weeks based on 40 students. Its current budget is based on 75. After the meeting, King declined to say how many students are enrolled. “We have no comment,” she said. Since Aug. 4, The Lens has repeatedly sought updated enrollment figures. The Lens filed a public-records request early Thursday for the school’s enrollment figures. King wrote back via email. King responded again late Thursday with the day’s headcount: 15 kindergarten students and one first-grade student. Recruiting has been difficult, and more than 170 kindergarten vacancies exist citywide. Another new charter, Cypress Academy, also made the decision to add first grade to its kindergarten-only first year plan. However, the board of Cypress added the additional grade through a public vote earlier this year. Reached Wednesday email, School Leader Bob Berk said the Uptown school has about 60 students enrolled. At the Foundation Prep meeting, board member Eric Jensen gave an enrollment report, which was relatively short and contained no numbers. 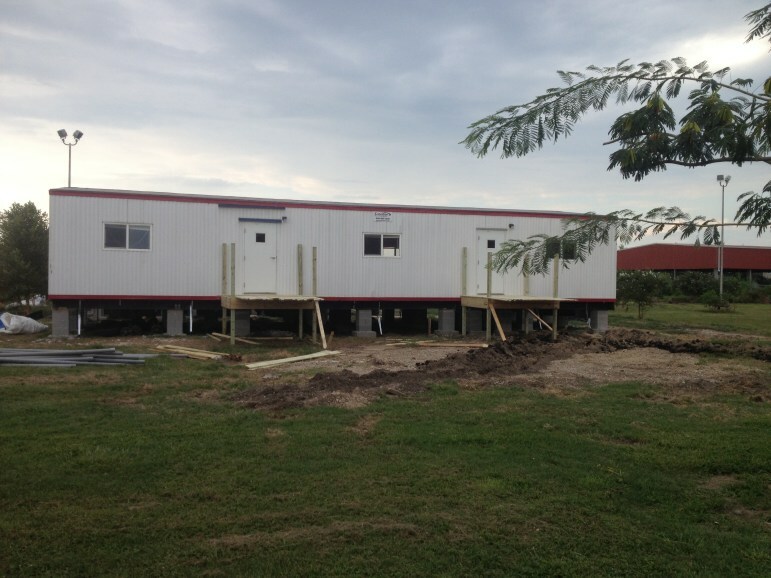 In facility news, the board learned the school’s modulars are almost ready for students after a delay in delivery. Outside the community center, several modulars were poised three feet off the ground but had no steps. Ramps and stairs appeared to be in progress based on the stacks of framing lumber and decking and a few freshly installed landings. One item notably absent from board discussion was the sudden addition of first grade. Kathleen Padian, who helps oversee charters for the Orleans Parish School Board, said Thursday that the board does not need to amend its operating agreements with Cypress or Foundation Prep. Both are already approved to operate schools with many grade levels. Such a change in a charter school, though, usually is approved by the school’s board. After the Foundation Prep board meeting, King said the Orleans Parish School Board had approved the addition of first grade and that the charter board simply had to “agree” with the decision. She said board members did agree, but no vote was taken. “There’s no official vote because it’s already approved,” board chairman Matthew Sherman said.